Pol Espargaro (above) has retaken the Moto2 World Championship lead, winning Sunday’s Tissot Australian Grand Prix while Alex Rins has won a thrilling Moto3 coming out of top of a multiple-rider battle to beat Maverick Vinales by just three thousandths of a second. Pre-race points leader Scott Redding was absent when the Marc VDS Racing Team Kalex rider was eliminated after a heavy crash in qualifying yesterday. He broke his wrist and underwent immediate corrective surgery, but is a doubtful starter for next weekend’s Japanese GP. Espargaro started from his fifth pole of the season but was obliged to fend off a strong early attack from Alex De Angelis (NGM Mobile Forward Racing Speed Up), who later set a new lap record. 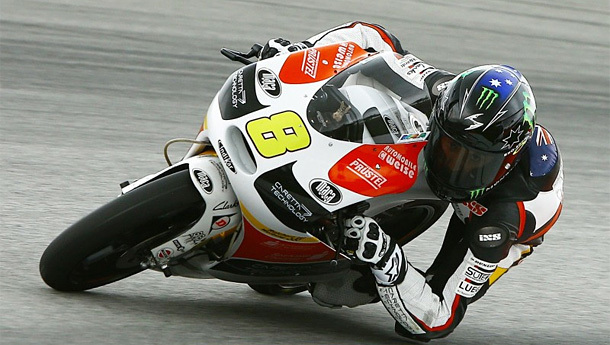 In the closing laps came another fierce attack from Thomas Luthi (Interwetten Paddock Moto2 Suter). 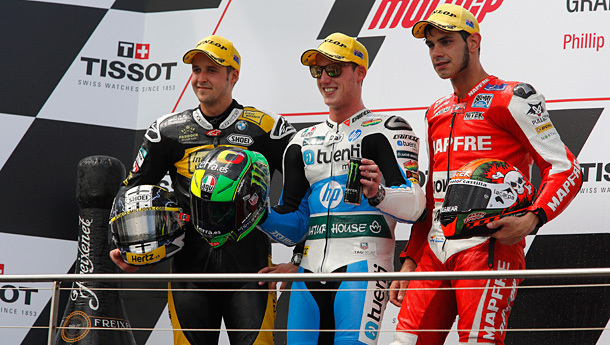 Moto2 podium L-R Thomas Luthi, Pol Espargaro, and Jordi Torres. Dominique Aegerter (Technomag carXpert Suter) lost touch in the final stages in sixth while battling with Mika Kallio (Marc VDS Racing Team Kalex), who finished less than two-tenths behind. Rabat came back to eighth, after running off the track and dropping out of the leading group, while holding third place, putting two-race winner Nico Terol (Aspar Team Moto2 Suter) ninth. Anthony West delighted with his top 10 finish in Moto2. 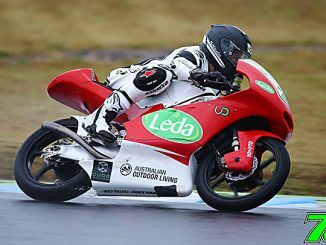 Australian rider Anthony West (QMMF Racing Team Speed Up) fought through to tenth in a crowd-pleasing ride after finishing the first lap in 20th. Moto3 champion Sandro Cortese (Dynavolt Intact GP Kalex) Ricard Cardus (NGM Mobile Forward Racing Speed Up). Danny Kent (Tech 3), Gino Rea (Argiñano & Gines Racing Speed Up) and Doni Tata Pradita (Federal Oil Gresini Moto2 Suter) claimed the remaining points. The Moto3 race was the only one of the day to run the full scheduled distance, set at 23 laps. In a class where Honda-powered machines are up against rival factories in a variety of prototype chassis, the top Honda rider Jack Miller came heartbreakingly close to a first rostrum finish. So close – but a great ride by Aussie Jack Miller to finish fifth in Moto3. The Australian finished fifth in a tight pack, but less than three-quarters of a second off third place, and only six tenths behind the winner. The top seven places were covered by just 1.1 seconds. Alex Rins took out the Moto3 in a thrilling race coming out on top of a multiple-rider battle to beat Maverick Vinales by just three thousandths of a second. Both riders decreased the championship-leading advantage of pole-sitter Luis Salom, who completed the podium at Phillip Island. Alex Rins after his win in Sepang. Rins’ latest victory has now matched Salom on six race wins this season as well as having won three of the last four Grands Prix. Remarkably, the top seven riders were covered by just over one second, with Niccolo Antonelli only a further 1.1 in arrears. 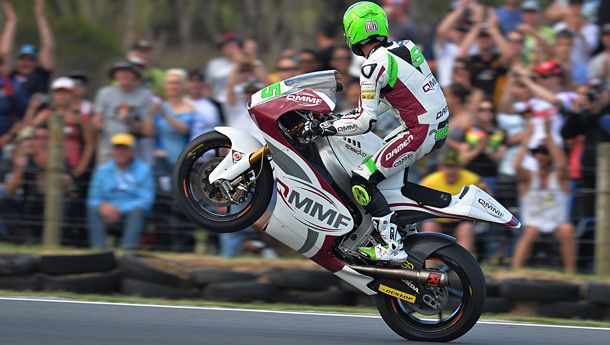 A titanic battle at the forefront saw a selection of riders enjoying time in the lead, whereas Salom ran as low as seventh but looked to be making his customary climb to the very sharp end in the closing minutes of the race. However it was Mapfre Aspar Team Moto3’s Jonas Folger who stole the limelight as the final lap began, shooting into the lead at Doohan curve only to run wide and drop to sixth three corners later. The run to line resulted in the closest finish so far this year in the World Championship, with Rins (Estrella Galicia 0,0) pipping Vinales (Team Calvo) after having both started on the second row of the grid. Rins’ teammate Alex Marquez finished fourth, with the first group completed by local favourite Jack Miller (Caretta Technology – RTG), Folger, front row starter Efren Vazquez (Mahindra Racing) and Antonelli (GO&FUN Gresini Moto3). Avant Tecno’s Niklas Ajo was a further 12.8 seconds behind and headed the second group, with Alexis Masbou rounding out the top ten for Ongetta-Rivacold. Mahindra’s Miguel Oliveira recovered to 26th spot and was fortunate to avoid injury after flying over his handlebars at the MG hairpin on the opening lap. Wildcard Lachlan Kavney (Bullet Racing) also hit trouble, finishing one lap down in 30th place. There is only five points now between the championship leaders with a maximum of 50 still on offer. The season will continue next weekend with the AirAsia Grand Prix of Japan at Twin Ring Motegi.